Princess Eugénie was a princess of Sweden and Norway at a time when those kingdoms were in a union. She was a composer, an artist, an author, a translator and a philanthropist. Princess Eugénie was born on 24 April 1830 and was the niece of King Karl XIV Johan. She grew up within a very musical and artistic family. Her father was King Oscar I, who was a successful composer and singer. Her mother  (Josephine) had also composed some pieces when she was younger. Princess Eugénie often performed songs at musical soirées held at the royal palace. She was taught both painting and music. The royal children were instructed in drawing and painting by the artist Anders Lundqvist. In 1835 one of that era’s most prominent watercolourists, the artist Johan Christian Berger, was hired by the royal family. He came to be very important for Princess Eugénie’s painting. The royal children’s piano-teacher was Adolf Fredrik Lindblad, and he also taught music and composition. Isak Berg was the royal singing instructor: following a brief career in the opera he became one of the most eminent singing teachers in Sweden. (Jenny Lind) was just one of his well-known students. At the royal palace almost every evening was rounded off by a musical soirée. Princess Eugénie revealed her talent for musical composition when she was just 13 years old. She composed a Vals in D-major for the piano. A year later she composed yet further pieces for piano, including the atmospheric Chanson du Chasseur, also known as Andantino. This last piece confirmed the princess’s potential to develop into one of her era’s major Swedish composers. Whilst Princess Eugénie’s brothers all undertook academic studies at Uppsala she received private tuition. She was a skilled watercolourist and drawer who documented life in detailed artworks and illustrated daily activities in a unique manner. Her multifaceted artworks portrayed decisive events as well as family-life, such as boat trips to the summer castle of Tullgarn. Many of the princess’s artworks depicted musical themes. She often made music together with her brother, Prince Gustaf. His death, in 1852, hit the royal family very hard. Princess Eugénie, who had already suffered from poor health as a teenager, became very poorly again and never fully recovered. This crisis in her life would also serve as a turning point for her. About 50 of Princess Eugénie’s artworks still survive. Some of them have even been printed and, just like her brother Prince Gustaf, Eugénie requested that her musical compositions might see the light of day beyond the enclosed sphere of the royal court. During the first years that she spent composing, she mainly produced music for the piano and 13 such pieces have been recovered. 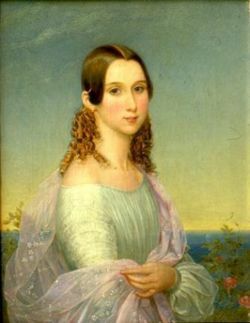 Louise Valse was composed at Tullgarn castle in 1853. It was performed at the king and queen’s ball held at the palace in January 1854. Tullgarn-Galopp was also composed in 1853 and was danced to for the first time at the king’s ball in January 1856. On that occasion all the dancers were also treated to Josephina Polonaise, which Princess Eugénie had composed when she was 23 years old. The list of the princess’s pieces for song and piano contains about 10 songs. These include Fiskaren, from 1850, which is a generously conceived and well-formulated song without lyrics set to a text by John Hollander. Princess Eugénie composed Novemberqvällen – also known as Romance – in a low keyed melody for alto, with text composed by Carl Wilhelm Böttiger. The song, written in 1862, is not easy to sing as it makes use of the triton, namely a musical interval comprising three adjacent whole tones. The song became popular, even outside the castle walls. Princess Eugénie also wrote duets, including Die Glocken, Fåglarnes morgonlof, and Hjertats hem. Fåglarnes morgonlof is a brilliant duet with piano, based on her own text in which she combined vitality and rich variations with spirituality. Without doubt this is one of Princess Eugénie’s best songs. Towards the latter part of Princess Eugénie’s life religion became very important. However, she did not turn towards her mother’s strict Catholicism but instead chose to follow the pietistic tendencies which were making inroads into Sweden during the mid-1800s. From a musical point of view this meant that Princess Eugénie no longer composed joyful dance tunes on the piano but instead prioritised spiritual songs, often accompanied by her own low-church texts. She published two collections of songs, entitled Andeliga sånger af Eugénie, (no year), and Andeliga qvartetter, from 1883. The last song in the collection, Den troende brudens pilgrimssång, with the princess’s own text, became very popular in both Sweden and Norway. Princess Eugénie was also a talented sculptress. She took lessons from Professor Johan Peter Molin during the 1860s. Several of her sculptures were produced in Parian ware, intended for sale for charitable purposes. She also displayed two sculptures at the major Gustafsberg exhibition of Parian ware as part of the 1866 Stockholm industrial exhibition, namely Norsk hornblåsare, and Sveagardist. Princess Eugénie’s sculptures include Våren, from 1872, Aposteln Petrus, Tonkonsten, Trumpetaren, all from 1868, Tron, and a bas-relief of King Karl XIV Johan. In 1873 Princess Eugénie was the first honorary member to be elected into the Konstakademi (academy of arts). Princess Eugénie was medically prescribed to spend the summer on Gotland to benefit her health and so a summer house, called Fridhem, was built for her just south of Visby. In conjunction with this she established an enterprise on behalf of needy children. Fridtorp 1, a children’s home for boys, was opened in 1866. Three years later Fridtorp 2, a children’s home for girls, was ready for use. By selling her paternal grandmother’s (Queen  (Désirée)’s) jewels Princess Eugénie was able to finance the provision of Gotland’s hospice, which was inaugurated in 1869. The Eugeniahem in Solna was another one of Princess Eugénie’s extensive philanthropic efforts. Further to the above Princess Eugénie was also an author and a translator. In 1864 she published a book entitled Les princesses de la Suède. Notices biographiques et historiques. In it Princess Eugénie recounted, in a pedagogical manner accessible to younger readers, the lives of eighteen Swedish princesses, from Katharina and  (Cecilia Vasa) through to King Gustav IV Adolf’s daughters. That same year the book was also published in Swedish and became very popular. Also in 1864 Princess Eugénie translated Korsets skola eller anvisning till ett kristligt förhållande under lidandet, jemte bönen, a work by the German pietistic author Mangus Friedrich Roos. Princess Eugénie’s poetical works were published in calendars and children’s magazines. For example, the poem ‘Aftontankar’ was initially published in the calendar Vitterhetsstycken and then translated by Ellen Isabel Tupper and published in London, entitled ‘Evening Thoughts’. Princess Eugénie was also an animal-rights activist long before the concept even existed. In 1882 she set up the Nordiska samfund för bekämpande af det vetenskapliga djurplågeriet (Nordic society against scientific experimentation on animals), which was a precursor of Djurens Rätt. She publicised her thinking on the subject in her 1885 book Striden för djurens rättigheter. Two years previously she had published Bilder ur Djurens lif, a children’s book which comprises drawings, poems, and her own stories as well as contributions by the likes of Zacharias Topelius. Princess Eugénie died on 23 April 1889, the day before she would have turned 59 years old. She lies in the subterranean Bernadotte funeral chamber in Riddarholm church in Stockholm. Eugénie, prinsessa , www.skbl.se/sv/artikel/Eugenieprinsessa, Svenskt kvinnobiografiskt lexikon (article by Ingegerd Björklund), retrieved 2019-04-22.